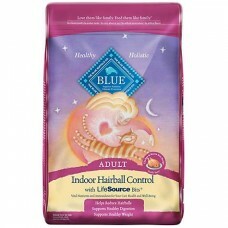 Blue Buffalo Blue Indoor Hairball Control Adult Chicken & Brown Rice Recipe Dry Cat Food, 15 lbs. Our natural Blue Indoor Hairball Recipe is holistically formulated to support the needs of indoor cats. It starts with carefully balanced calories to help indoor cats maintain an ideal body weight, plus it contains a unique blend of three natural fiber sources to help reduce hairball formation.